Fighting ants, giant solider termites, and foraging worker ants recently discovered in 100-million-year-old amber provide direct evidence for advanced social behavior in ancient ants and termites—two groups that are immensely successful because of their ability to organize in hierarchies. The new work, led by scientists at the American Museum of Natural History and the University of Kansas, and published today in two papers in the journal Current Biology, proves that advanced sociality in ants and termites was present tens of millions of years earlier than indicated by the previous fossil record. "Ecologically, advanced sociality is one of the most important adaptive features for animals," said co-author Dave Grimaldi, a curator in the Museum's Division of Invertebrate Zoology. "All ants and termites are social, and they are ubiquitous across terrestrial landscapes, with thousands of described species and probably even more that we haven't yet found." 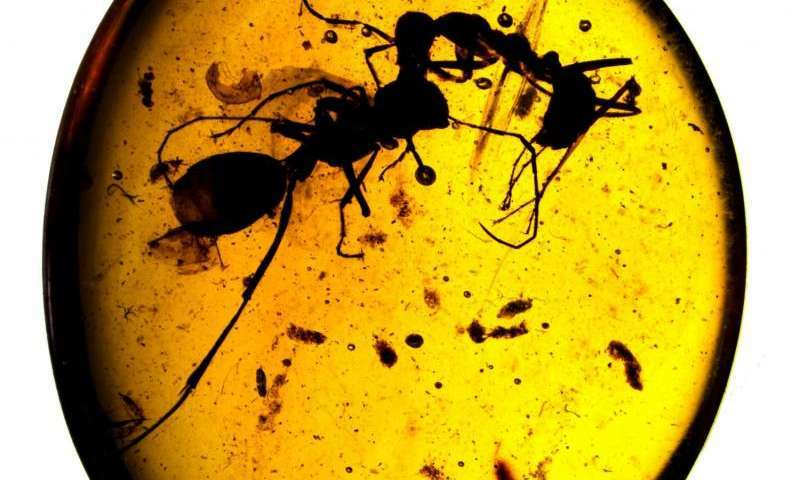 "In the Cretaceous amber we examine, the ants and termites represent the earliest branches of each evolutionary tree, and the species are wildly different from what their modern relatives look like today," said co-author Phillip Barden, a recent graduate of the comparative biology doctoral program at the Museum's Richard Gilder Graduate School and a National Science Foundation Postdoctoral Fellow at Rutgers University. "We wanted to know how social these creatures were, if they were social at all." 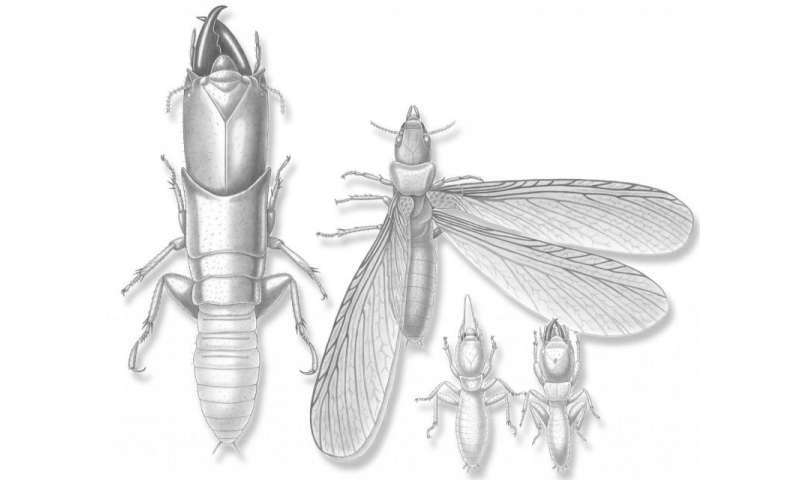 In termites, the researchers made this determination based on the diverse anatomy of the animals, indicating the presence of castes. 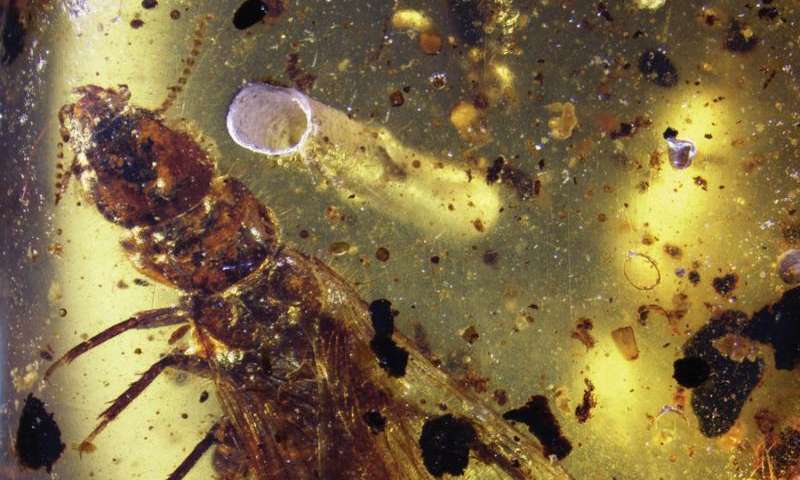 They found six different termite species preserved in the amber, two of which are new to science: Krishnatermes yoddha, comprising workers, reproductives, and soldiers; and Gigantotermes rex, based on one of the largest soldier termites ever found—about an inch in length, half of it being its head, with scissor-like jaws. "We know that wingless solitary relatives of ants don't fight or defend territories against other species," Barden said. "But modern ants war all of the time. The behavior of these fossil ants, frozen for 100 million years, resolves any ambiguity regarding sociality and diversity in the earliest ants." I"m so glad we can find and analyze such precious items. It really quiets the insane illogical ideas of christian science and other non evolution believers. I'm Christian and I have no problem with evolution. Please don't paint us all with that same 'stupid' brush. Speaking on terms of archeaology, then why dont you tell me about Jesus's diapers? I mean we have tons of items from ancient China that is over 5000 years old muc older than your christian god. All those items are more important to keep than anything from your god? THree kings even visited your baby god, and didnt keep anything? I would love to have Jesus' dirty diapers, its gods diapers and worth something right? His father was a carpenter. That has never been a high paying job. I'm sure what ever diapers he used -if they even used any at the time - would have been used to bits and discarded. They didn't have pampers back then and poor people didn't waste stuff. I'm not here to preach to you or explain things that happened a couple thousand years ago. I wasn't there. I don't try to preach religion to people here or anywhere else as far as that goes. All I asked YOU to do is not ASSUME that just because someone might believe in GOD they don't believe science is accurate. Don't bother answering back as I won't be reading it anyway. I automatically block people on here that don't have anything to add to the subject of the article and only try to insult others. You will just be one among a dozen or so others that will no longer troll and ruin the comments sections - at least for me anyway. Its ok 24 VOlts, you can block and continue to hide things that may allow you to see how the real universe works. By the way, you still didnt explain why there is nothing found leftover from jesus, diaper, spoon, something: but there are still many many things found from human civilizations that are much older, even bug civilizations and societies that are 50,000 times older than jesus. I can explain it for you, but you know the answer i think.